June 19th, 2012 The new springs are installed. Those lifted the front end back up to where it should be and increased the clearance between the track bar and the oil pan sump. Changing out the bump stops to limit up travel by an inch also helped. Both were necessary but still not enough. 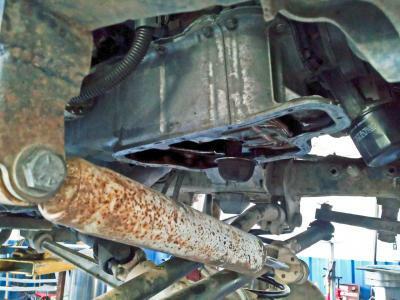 Modifying the sump is still necessary. 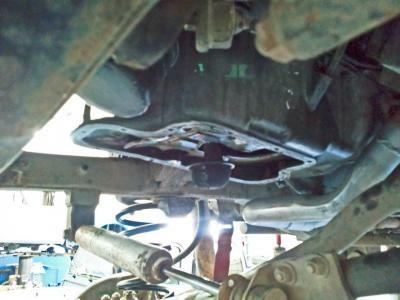 The 3.5L oil pickup is directly over the track bar so any change to the pan requires changing the oil pickup. The oil pickup from the 1997 3.0L engine is a direct replacement for the 3.5L oil pickup and positions the screened pickup several inches further towards the front of the pan. Easily far enough forward to clear any necessary modifications. Modifications need to be made to the windage tray but a set of tin snips takes care of that. I'm a little concerned about moving the oil pickup forward from the rear of the pan. There is a good reason for the pickup to be positioned at the rear of the pan. I'm not quite sure there's enough oil volume in the pan to keep the pickup from being uncovered under strong acceleration or when making steep accents. Of course, the fix is installing baffles in the sump but I still believe a custom sump is a better solution. Even with the modifications being made to the sump there will still be some minor clearance issues. 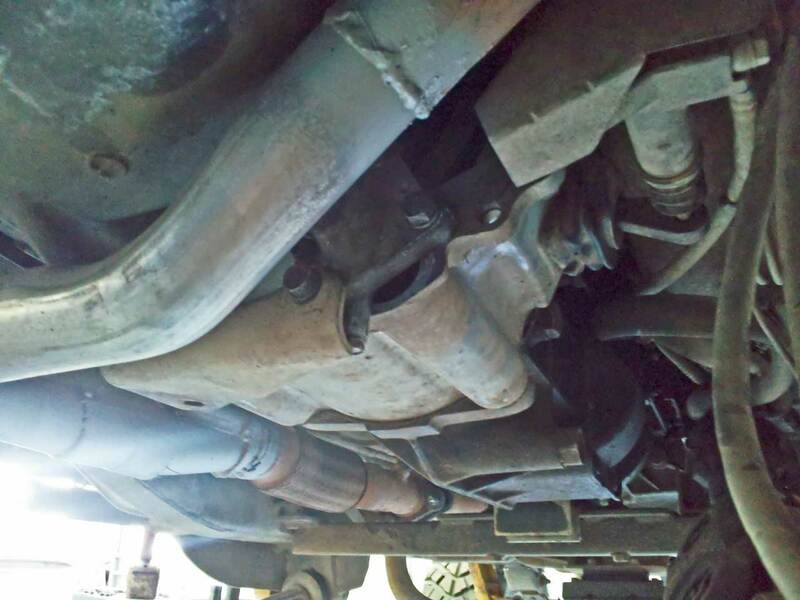 In the picture to the right you can see one of two small holes not covered by the upper half of the oil pan or the backing plate. A little RTV will fill this easily. The gap on the other side is even smaller. Just to the left of the clutch slave cylinder is the where the upper access plate for the flex plate goes (which should be in this week). July 2nd, 2012 Two Saturdays of wheeling and a full week of driving back to work and everything is still working. 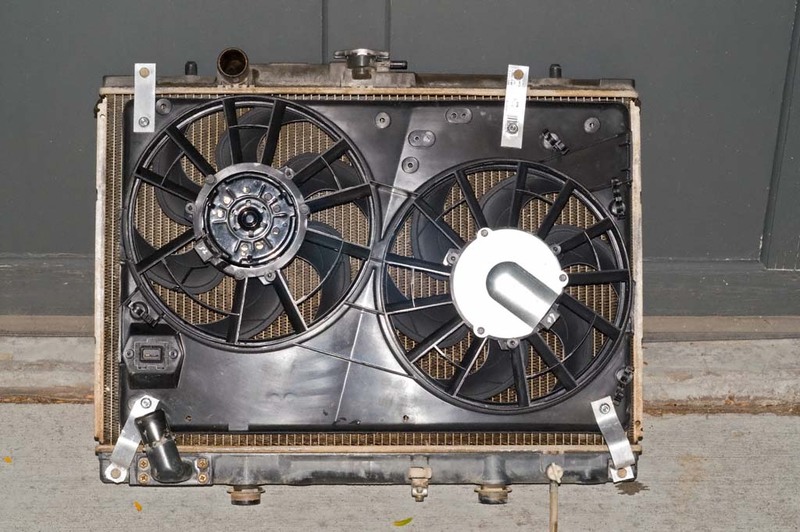 The only outstanding issue left revolves around the cooling system. With temperatures hovering in the 90-100° range my existing cooling system just isn't up to the task. A good part of the cooling problems on the highway are caused by the ARB bull bar. With a winch installed and big lights mounted in the center there's almost no natural air flow to the radiator. Removing the 'skid plate' under the bumper (visible below winch in the picture to the right) helps but the lights are the real killer. 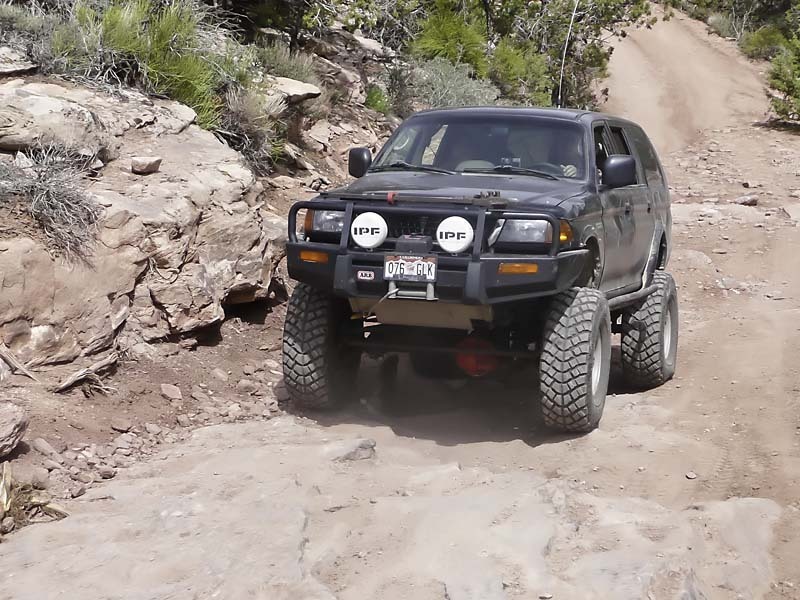 At some point before our next Moab trip I'll make modifications to the skid plate to allow more air flow but I'm not willing to loose the lights just yet. The rest of the problem is the general weight of the vehicle. 5500 lbs. in daily driver mode and up to 6800-6900 lbs. on extended trips is a LOT of weight to be toting around. Moving that much weight around requires that the engine work harder and the harder the engine works the more heat it produces. Which means that the cooling system has to work harder getting rid of that heat. Well, not much I can do about the overall weight of the vehicle. After spending some time surfing the forums and researching cooling systems and radiators I decided the first step will be to replace the radiator. I was previously using a custom coper five row built by a shop locally. Unfortunately, the workmanship wasn't anything to write home about. After leak number six I gave up even trying to get it fixed. Shortly thereafter the company went out of business. I guess I shouldn't be surprised. Griffin Thermal Products and Ron Davis Racing Products seem to be the two top recomendations on Pirate4x4.com with both coming up about equal. Griffin is a avid supporter of the off road community so I decided to go with them for my new radiator. Bill Ansell's article "The Cooling Bible" also played a part in helping me to decide. 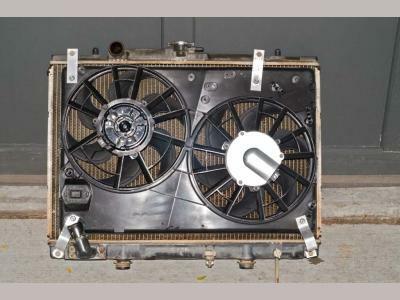 I spent some time reading Griffin's Off Road Series section but ultimately ended up calling because Griffin doesn't make a radiator for the Montero Sport - total surprise, right? They requested that I send them a sample which I immediately agreed to do. The plan is to build a drop in replacement for the stock radiator - retaining the factory mount points, fan shroud mounts, coolant drain, and inlet and outlet in the factory location at the factory angles - so I didn't want any issues with someone misinterpreting or misreading a measurment. Since this will undoubtedly end up as a normal production product it will benefit the most number of Montero Sport owners if this isn't a custom, one-off freak of nature. A core size hasn't been settled on yet. Tom at Griffin broadly sugested the 1.25" tube, dual row, 2.75" core but I didn't have time to fill him in on all the details of the vehicle and its use. We'll cover the details when the sample arrives at Griffin. July 13th, 2012 Finally a response from Griffin. Frankly I'm a little miffed with their lack of response and run-around for the last week. The radiator showed up at Griffin by noon the 6th and after four phone calls consisting of 'someone will get back to you', today I had to refuse to get off the phone until I spoke to someone. This is not the behavior I expect from a company since I was following explicit instructions given to me directly by Tom, Griffin's VP. When someone gives me instructions and I follow them to the letter, I expect the person that gave them to me to hold up their end. Anyway, enough ranting. I was put in touch with Pattric to get the ball rolling. All my information was relayed, and other than Pattric checking in with one of their engineers on Monday to confirm the core choice they're supposed to get started. I'll know more on Monday. I hope. With the new engine up and running for a couple weeks I now have a feel for how things are working. It was time to hook up my OBD logging software ScanXL ELM from Palmer Performance and start taking real measurments. The good news is that the 3.0L Engine Control Unit (ECU) is reasonably happy with the 3.5L engine. I suspect that if this swap was done with a stock vehicle everything would be close enough that there'd be no reason to change anything. Fuel Trim - Long Term Fuel Trim (LTFT) minus Short Term Fuel Trim (STFT) - is running in the 0% to -18% range with the average at about -9%. +/- 25% is where the MIL is activated and you get a 'Too lean/Too rich' OBD code. While this isn't great, it's still within the range the ECU can make adjustments. Almost certinly the 'high' negative fuel trims are due to the almost 50cc difference between the SOHC 3.0L injectors and the SOHC 3.5L injectors. The timing maps are off a little. This isn't surprising. I've tuned many Chevy 350s and Pontiac 350s over the years so I'm well aware of the differences between short stroke and long stroke engines. There's just a bit too much timing in the mid and top-range for a vehicle this heavy at this altitude. I seriously doubt that either of these issues would even be noticed on a stock or even reasonably close to stock Montero Sport, especially at lower altitudes. However, this Sport isn't stock and I'm not one to settle for 'mostly half working correctly some of the time'. So, while I'm waiting for Griffin, the next step is to correct the ECU. I'd originally planned on using a piggy-back ECU solution if the need arose but EvoScan and Tactrix have progressed to the point that reprogramming the stock ECU may be the cleaner solution. With EvoScan and Tactrix the big question becomes whether it's possible to flash the existing Mitsubishi ECU and if not what ECU will have to be retrofited to make flashing possible. According to both Tactrix and EvoScan it's possible to flash 1998-2004 Montero Sport ECUs using either the Tactrix Openport 2.0 or EvoScan 1.3U setups. We'll see if I have to upgrade to yet an even newer ECU on my 1997 Montero Sport to make this work. On a more possitive note, I already have a 2003 Montero Sport with the 3.5L so I'll be able to download ECU ROMs from both vehicles and compare settings. I won't have to guess what Mitsubishi might have done with their fuel, timing, injector maps, etc. and then try and replicate them on my 1997. I have an Openport 2.0 from Tactrix arriving this afternoon and I'm ordering a wideband O2 setup today. A wideband O2 purchase is long overdue. I'll take a look at the ECU ROM from both my 1997 and 2003 Sports, start pulling and comparing data this weekend and proceed from there.